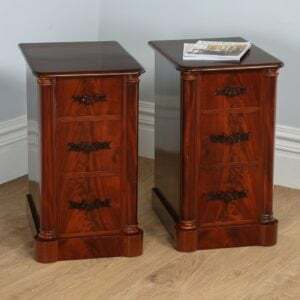 Here is an attractive pair of Georgian style reproduction mahogany inlaid chest of drawers, circa 1970, in good condition. 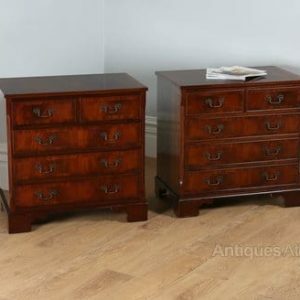 Here is an attractive pair of Georgian style reproduction mahogany inlaid chest of drawers, circa 1970, in good condition. 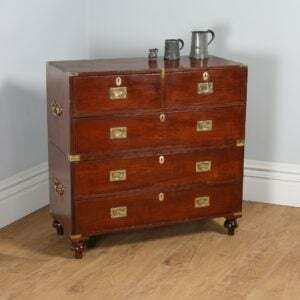 The style of these chests emulates that seen during the George era. 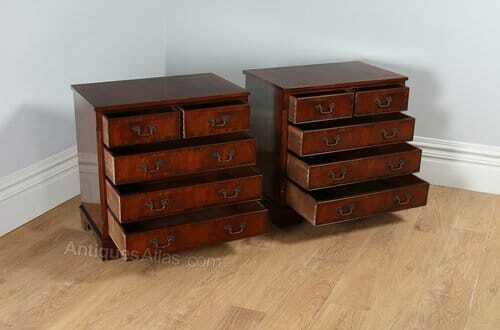 The chests are designed with two small drawers at the top, with three larger drawers below. 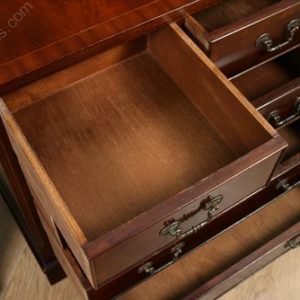 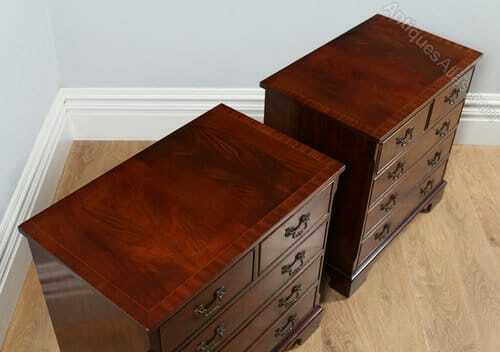 The chests benefit from lovely flame mahogany veneers to the tops and drawer fronts. 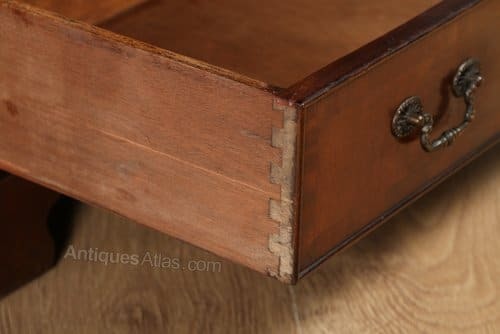 The tops of the chests are decorated with cross banding and satinwood string inlay. 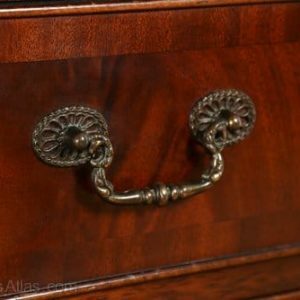 Equally, the drawer fronts boast further cross banding, finished withcock-beaded edges and Georgian style meal swan neck handles. 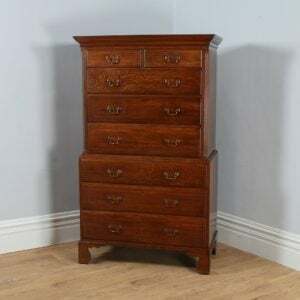 Further detail can be seen with the pretty reeded and chamfered edges to the fronts of the chests. 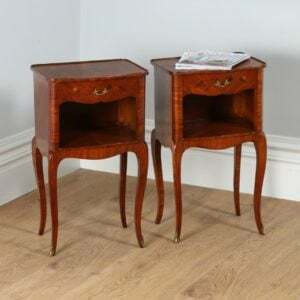 The chests stand on class Georgian style bracket feet. 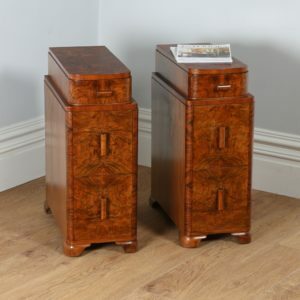 The drawers feature solid mahogany drawer linings with the drawer bottoms, whilst the frames and drawer bottoms are constructed of engineered timber. 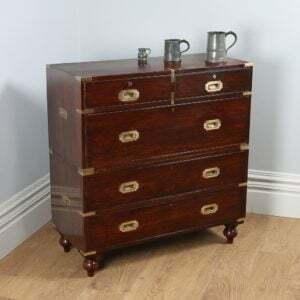 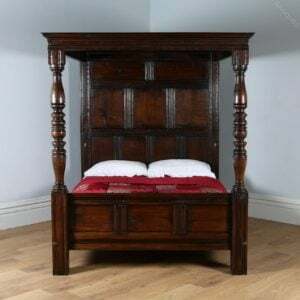 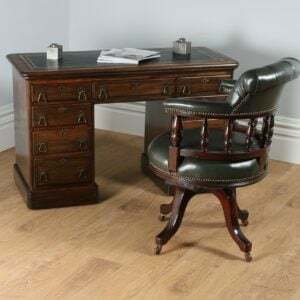 This item would look great in a variety of rooms from the hallway, to the living room as lamp tables, or the bedroom, either side of the bed as bedsides. 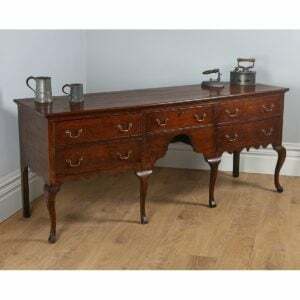 They have a beautiful deep rich patina, which has been generated by the centuries of cleaning and care they have received. 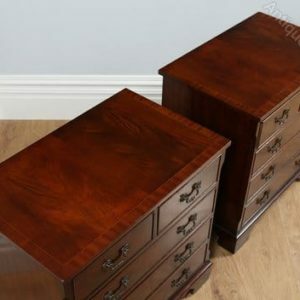 The chests feature a rich red mahogany colour. 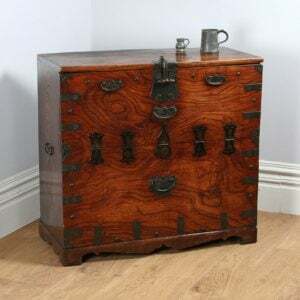 As they boast the original polish, they have a fantastic colour and patination this can only be achieved through age and years of care and cleaning it has received. 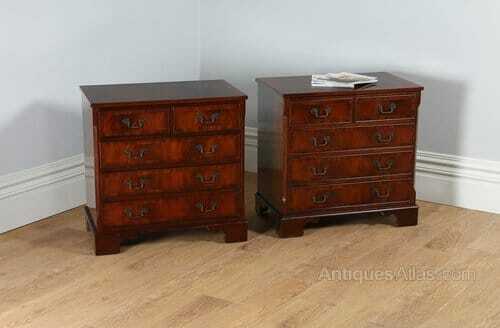 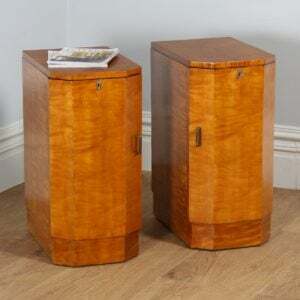 The pair of bedside chests are in good original condition. 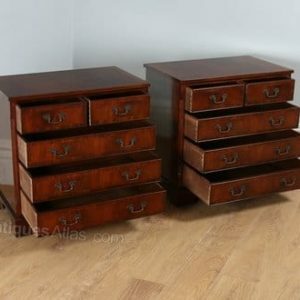 There are no marks, scratches or stains to the tops of the chests. 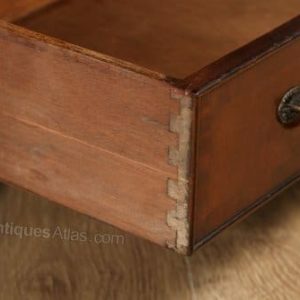 There is no missing inlay or cross banding. 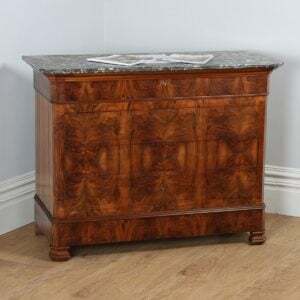 Nominal old use marks to the leading edges but nothing significant considering the age of the item. 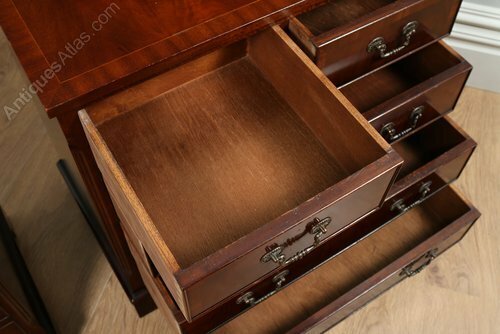 The drawers are free running and close flush to the frame. 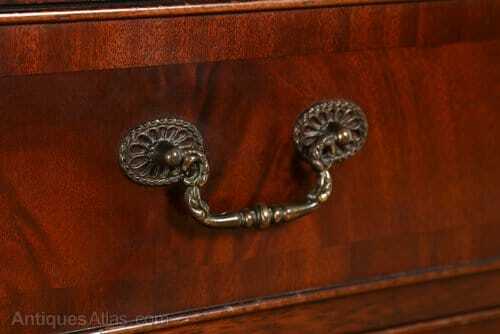 These items are solid in joint, they do not wobble and are ready to use.